Our client was returning from a night of dancing and drinking with friends in Hollywood. He was proceeding south on the 110 Harbor Freeway and attempting to transition to the westbound 10. 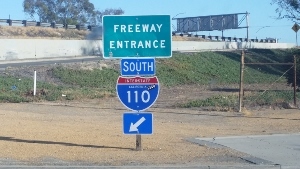 The off-ramp from the 110 to the 10 was closed, however, for construction so our client followed a detour continuing south on the 110 toward USC. As our client was following signs for the detour route, a CHP officer pulled alongside him. According to the CHP report, the CHP officer (while driving and at 2:30 p.m.) looked over at our client and determined that “the suspect looked drunk.” He also claimed that our client almost ran into him, but passengers in our Client’s car said this did not happen. So the CHP officer pulled over our client. Our client’s parking of his car was safe and without note. In other words, it did not look like he was compromised in his ability to control the vehicle as he intended. The CHP officer then noticed “the strong odor of alcohol” when he approached our client’s vehicle, which had three passengers – all drunk – in it. From this smell, the CHP officer attributed it all to our Client and asked him if he was drunk. Our client denied it. The CHP officer then administered a series of field sobriety tests, which the passengers in our client’s car stated our Client passed. However, the CHP report said our Client failed each test. Our Client was then handcuffed and taken to the CHP station. In 50 Words or Less: Los Angeles, first time DUI, client almost sideswipes CHP officer and then refused to provide breath or blood sample, case resolved for wet reckless. At the CHP station, our client was asked to provide a breath sample to test for alcohol content. Our client refused. He was then told he consequently must give a blood sample and our client, without refusing to do so, asked if he could provide a urine sample instead. Police officers in general do not like to get urine samples, as it can spill on their hands, may smell and the sample container can be covered in urine, too. So police officers are quite adverse to even offering a urine test, even when blood testing is unavailable. Here, however, officers took our Client’s request for a urine test as a refusal to give blood and simply reported that our Client refused to provide either breath or blood. However, our Client was never advised that he had to give blood if he refused breath. This was never made clear to him. Not surprisingly, page two of the DS-367, a form law enforcement must complete incident to any DUI, was blank. Page two is where the reporting officer must sign, under penalty of perjury, that a proper admonition was given to the suspect, was not signed. The case was filed in the Metropolitan Court. Our Client then retained Greg Hill & Associates. At the arraignment, the initial offer was thirty days of County Jail for the refusal, a $500 fine, plus penalties and assessments, a six month DUI program and five years of summary probation for the DUI based on the CHP officer’s statement that our Client almost collided with him. Greg Hill then went about pointing out to the City Prosecutor, through a letter, that the admonition was insufficient, if not improper. He also presented evidence that the supposed near crash really did not occur at all. It took a bit of time, but ultimately, the City Prosecutor relented. He improved the offer to a wet reckless (Vehicle Code § 23103 pursuant to Vehicle Code § 23103.5) with standard “First Time” offender terms ($390 fine, plus penalties and assessments, a three month DUI course and 36 months of summary probation), which our Client accepted. He was relieved to avoid jail time and the large fines the City Prosecutor first offered.